Listen up! David Beckham added a new tattoo to his collection this week, and you might be surprised what design he opted for…a small yellow and blue image of the infamous minion character from the animated children’s film “Despicable Me!” Apparently, his three-year-old daughter, Harper, chose the design for David Beckham’s tattoo (which is just a transfer tat, by the way), and the proud father of four was more than happy to oblige. If the British model and soccer star wasn’t already at the top of the list for best dad ever, he certainly is now! When it comes to tattoos, David Beckham is a bit of an aficionado. 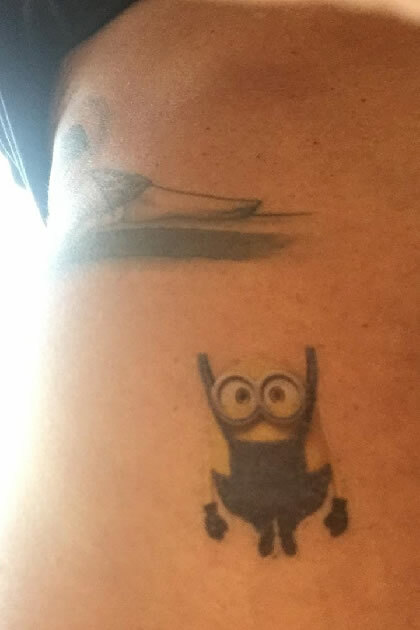 From religious images to ink dedicated to his wife and four children, he has dozens and dozens of tattoos scattered across his body – on his neck, arms, back and chest – so when Harper expressed an interest in Daddy adding a minion tattoo to his collection, he probably thought, “what’s one more?” David Beckham’s tattoo features an adorable image of a “Despicable Me” minion character inked in yellow and blue, goofy goggles and all. Thanks to David Beckham finally joining Instagram this year, we now know that three-year-old Harper loves trying to make her daddy feel pretty, and it appears she has some say in what ink he gets too! Victoria Beckham shared a picture of David’s new tattoo on Twitter, captioning the snap, “Harper has just added to Daddie’s tattoo collection x happy Tuesday in the sunshine! 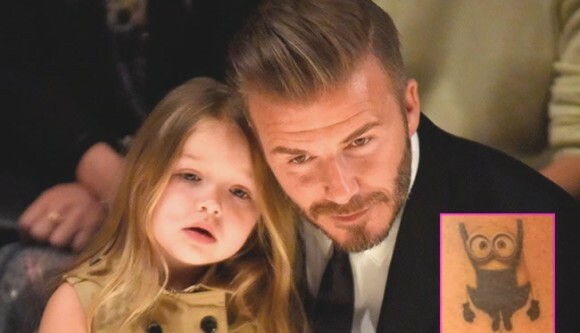 X vb.” Despite being international superstars, David and Victoria Beckham always seem to make time for their children, and David’s new minion tattoo solidifies his status as Daddy of the Year in our book!